If you favour a second referendum on Brexit (a prospect that is now, February 2019, receding), you should not only think of what you should ask the people, but how you would reconcile their choices. This is a central question of Mathematical Social Choice, with attempts to answer it since the middle ages (which is discussed in the ‘History’ section later in this post). Here, the first 4 columns are Remain voters whose preference is 1. Remain, 2. Deal, 3. No Deal. The next 3 columns are ‘Hard Brexiters’ whose preference is exactly the reverse. The last 2 columns are voters whose first preference is Deal, with one of them having Remain as their second choice, the other No Deal as second choice. These preferences and their distribution are not unrealistic. A voting rule now tells us how to distill ‘the will of the people’ from these preferences. But which rule should we choose? There are several contenders for such a rule. This declares as winner the option that has gotten the most first-choice votes (so one does not even need a second choice and the ballot paper is simpler). In parliamentary elections in the UK, the MP representing a constituency is chosen in this way. Here the most first-choice votes (4 out of 9) are for Remain, but this is not a majority of all votes – 5 out of 9 would rather leave the EU without or with a deal. This means that the option that gets the least first votes is discarded, and the second preference of the voters who made that choice is counted (as if they would be asked to vote again in a ‘runoff’ vote, assuming that the others stay with their first choice). 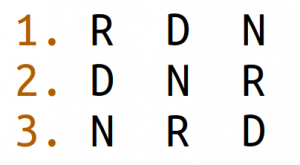 Here, these are the voters who chose ‘D’ and their votes are split, one of them for ‘R’ and the second for ‘N’. The total is now 5 for Remain and 4 for No Deal, and Remain is the winner as the declared ‘will of the people’ according to this rule. The rule seems clear and fair enough, but it has its problems. The main problem is called strategic voting which means that voters have an incentive to mis-state their true preference. Namely, the minority (of people who chose ‘D’) now have in effect the casting choice between two polarised outcomes. 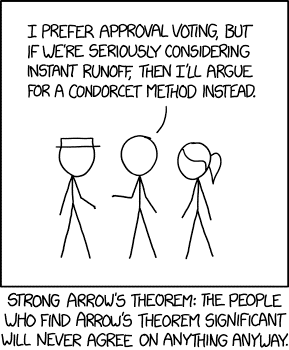 If the above preferences were known (supported by opinion polls, say), then an ‘N’ voter as above would have an incentive to mis-state their preference instead as 1=D 2=N 3=R (that is, swap their first and second choices), to let N become the decisive minority with 2 out of 9, after D which now has 3 out of 9 first choices. The other 2 N voters would both choose D and create the final vote 4 R versus 5 D, meaning to the leave the EU with a deal. While it remains doubtful that voters are that strategic, it would, on the other hand, create an incentive to be a bit more moderate. However, not all voting rules favour R for the above voter preferences. 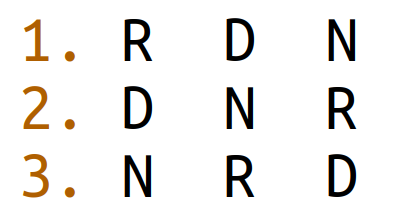 This gives the following clear collective preference: a strict majority prefers D over R, and another strict majority prefers R over N, and another strict majority prefers D over N (which does not follow from the first two, see below). Here the ‘will of the people’ is D first, R second, N third. Sounds great, but D was a first choice for only 2 out of 9 voters. Does this rule head for mediocre choices? Or for useful compromise? Yet another voting system tries to avoid cycles by giving points for first and second choice, for example 2 points for first choice, 1 point for second choice, 0 for third choice (instead of points 2,1,0 we could also give 3,2,1 with the same effect, which is just an extra point everywhere). The option with highest total number of points wins. The Condorcet method is named after the Marquis de Condorcet (1743–1794), who died in a prison cell, poisoned, during the French Revolution. However, it was already invented in 1299 by the Majorcan polymath Ramon Llull (ca. 1232–1316). To remember that name (which has 4 letters ‘L’ in it and one vowel) think of the binary number 11011. Llull indeed invented the binary system and is considered by some as the inventor of information theory. He was so enthralled by it that he thought St Mary should be added to the Holy Trinity to make their number a power of two. Heretic stuff that did not make him popular with the church authorities. With the discovery in 2001 of his lost manuscripts, Ars notandi, Ars eleccionis, and Alia ars eleccionis, Llull is given credit for discovering the Borda count (re-discovered several times in later centuries) and the Condorcet criterion. A very accessible book for general readers on these problems is Szpiro’s ‘Numbers Rule: The Vexing Mathematics of Democracy, from Plato to the Present’. The post gives the views of its author, not the position of Democratic Audit. It was first published on LSE Department of Mathematics’ Research blog. Bernhard von Stengel is a Professor of Mathematics at the London School of Economics. He teaches discrete mathematics, optimisation and game theory at LSE. He is also on Twitter – @bvonstengel. How would that be considered based on your experience? No deal will have catastrophic consequeunces in the short to medium term. It is upsetting/dangerous that no deal has been normalized to such an extent.